Dave Delaney and his company, Griffin, put on quite a great little project with CESBound. They took an old VW bus, after hours, and restored it, and then drove it from Nashville all the way to Las Vegas for CES. Along the way, they made media, met friends, told stories, shot photos, froze a bit, played music, and had a blast. When they arrived at CES, the thing they kept hearing (and I heard it when I visited the booth, too) was, “Man, it’s so cool that you restored this bus and took it on a huge road trip. That’s so much more genuine than renting a nice car and putting it in the booth. The side of the van was covered in little Polaroid photos from the road trip. The back of the van was playing some of the CESBound TV episodes. Everyone around the bus, whether they were from Griffin or not, seemed really happy. Dave and the whole rest of the team (we know Dave because he’s one of us, but there’s also Melanie Pherson and tons of other names that Dave or someone will add when they see this post) really did a lot to make the >Griffin Technology CES story into more than just a company selling iPhone and iPod accessories. 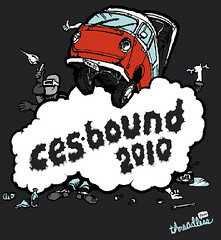 They made a special site, CESBound.com. They befriended the VW community via some forums, where they were told that, when the bus breaks down, someone will come and help them out, no matter where they are in the country. They did all kinds of gatherings and other on-the-road relationship building on the way to the event. Tell a story and tell it well. Capture the story in multiple types of media. Involve people by communicating and relationship-building. Tie it to your core theme and beliefs (Griffin is a lot about art, design, expression). Build a meaningful online presence around the experience. Don’t call CESBound a microsite. Do it inhouse. Near as I can tell, they had no external agency help with the project. Share the spotlight. Griffin also partnered with Threadless to create a special CES iPhone case, with BrightKite for location services, and more. Bring it all home. The team did a great job of telling a story that also strengthened the brand. There’s more to how Griffin told the story, but you can see it all at CESBound.com. As for us, let’s just think about how heartfelt marketing delivers, and what you can do with this kind of information.